Originally published and copyright 1985. C-RA Vol VIII #1. Unauthorized duplication or use is prohibited and in violation of international copyright law. The author of this article. Victor Sostak, is a specialist on Carpatho-Rusyn folk instruments. A graduate of the University of Uzhhorod, he is now a curator at the Uzhhorod Historical Museum. This article is the first in a series on folk instruments and was translated by Margarita S. Mikhalyova and Jerry Jumba. Night was drawing near. We were sitting around the bonfire, from time to time throwing on a few dry branches. Suddenly, in the distance, we heard faint fluttering sounds. Then the fluttering changed to resonant, accented bursts that spread like a wave over the highlands. it rolled over the tops of the fir trees to every hut and down into the meadows. The sound was everywhere, bouncing from the high rocks and continuing outward a great distance. Once upon a time in the Hutsul region there lived a magic craftsman. He was a very old man with flowing grey hair like the highlands covered with snow, a wrinkled face like the furrows in the field, and a great curved back with a peak like the Hoverla mountain, the highest in the Carpathians. He had no wife or children. He made many unusual, finely-crafted musical instruments, such as the cymbaly (a stringed instrument struck with mallets), the piscalka (whistle), the flojar (whistle), husly (violin), maly basy (stringed bass), and the berbenycja (drum). One autumn, three brothers traveled from the distant highlands to visit the magic craftsman. They needed a special musical pipe made from the birch tree. They called it a berezivka and asked the craftsman if he could make such a pipe for them. The old man was surprised that the three brothers asked for only one pipe. They explained that they were three orphans who worked as shepherds. They could not afford to buy three birch pipes. They would take turns playing and hope that this special instrument would frighten the wild animals away from the flocks. "Alright," answered the craftsman, "I will make a pipe during the springtime, a pipe which no person has ever had." So the old craftsman went into the forest and selected a certain tree that had been struck by lightning. He cut it into two even pieces and hollowed out the inside. He covered the inside and outside with sheep fat for ninety-nine days. This sealed the wood, protected it from cracking, and kept each piece perfectly straight. He glued the halves with resin from the tree and then wrapped it with rings of birch bark. From the heart of a maple tree he carved a mouthpiece and set it in just the right position. Finally. one evening the craftsman began to play the new pipe behind his mountain cottage. A beautiful, powerful sound shook the mountains, so that people ran out of their homes and listened in amazement to the enchanting music. The three brothers returned to the magic craftsman and he gave them the tremendous wooden pipe on which he had burned a special inscription: Trem bratam -- "To three brothers." The brothers returned to their village playing their magical instrument. Everywhere they went people were astonished to hear such music. News of the magical pipe spread throughout the Carpathians. Because it was the three brothers who played such an instrument, the people began to call the wooden pipe a trembita. In Transcarpathia (Subcarpathian Rus'), there are several kinds of trembitas, each with its own special function. The small koljadnyc'ka trembita, less than three meters in length, is used to signal that Christmas carolers are coming. 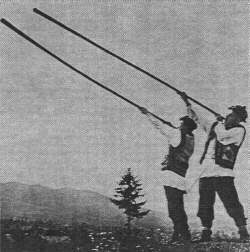 The vivcars'ka trembita, three meters in length, is used by shepherds to signal their location in the mountains, to call the sheep in at dusk, and to signal if the herd is attacked by bears or wolves. Finally, the third type, the pochorona or funeral trembita, is longer than three meters and its main function is to play outside the house where the body is laid out for.viewing. There are special funeral melodies to help express the grief of the village, an age-old ritual that is vividly portrayed in the motion picture, Shadows of Forgotten Ancestors, based on a short novel by Mychajlo Kocjubns'kyj. The large trembita is also played on happy occasions, such as festivals and weddings. The wedding procession and the home of the bride and groom are surrounded with joyful trembita calls in a major key. They sound out so happily that other shepherds across the mountains answer the joyous calls. Another happy occasion is in the spring when farewell calls are played to the residents of the mountains. The people in the valley hear these most cheerful trembita calls as the shepherds signal the return to their native villages. It is dark now. The ancient fir trees stand in the shadow of the moonlit night and touch the sky. One last time we hear the trembita sound. It is a sorrowful melody of departure, a shepherd leaving a loved one. Z svojim mylym ridnym krajem rozmovu povedu. . .
and Thereby speak with my dear native land. It is very difficult to imagine the Carpathian forests and highlands without the magic song of the trembita.